What does Hoozzi Services do? Supports homebuyers during one of life's most stressful events by helping to arrange a multitude of services and products, from finding a removal company and arranging the installation of broadband and TV services, to selecting the right home and contents insurance. Hoozzi Services consults with well-respected brands, as well as localised suppliers in the UK to arrange quality services and, in most cases, preferential and exclusive rates. Offers continued support to homebuyers, for as long as you are a Hoozzi client. We will even send out reminders when renewals are due. Provides all this for free. How does Hoozzi Services work? Your homebuyer selects a service they are interested in. We will then contact the customer by phone within 24 hours to discuss their requirements. Based on the homebuyer’s requirements, we will then find a suitable supplier and, in most cases, provide a quotation. If the homebuyer is happy to proceed, we will then put them in contact with the supplier. After every transaction, we will contact the homebuyer again to ask for their feedback on the service and to rate the supplier. It’s that simple! You do not have to do anything: we do it all. 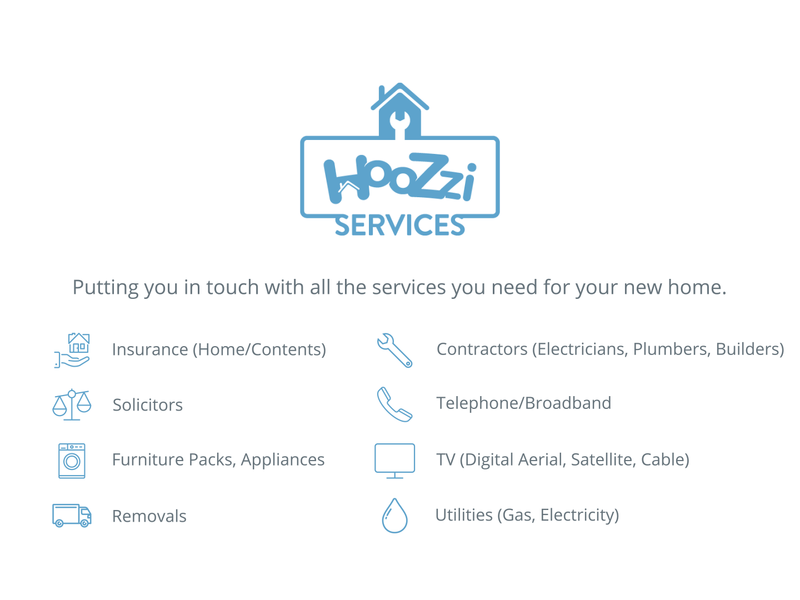 How will Hoozzi Services benefit you? By providing your homebuyer with a more complete buying experience, guiding them through the customer journey from reservation through to completion and beyond. By promoting customer care, emphasising a willingness to go beyond the sale of a new home and alleviate some of the stress that accompanies the moving process. By enhancing your brand. Customers are more likely to stay loyal to a brand that has given them an exceptional customer experience and exceeded expectations. How do you offer this service to your homebuyers? Hoozzi Services is a default function of the Hoozzi software. Encourage your homebuyers to sign up to Hoozzi from reservation, allowing them to take advantage of services straight away. We are confident you will agree that Hoozzi Services is a great addition to the Hoozzi platform and will add real value, not just to the end user, but also to your brand. As always, we welcome your feedback – please contact us if you would like to discuss Hoozzi Services in more detail.